Any festival in South India does not start with out this yummy festive dish. The nice aroma of this appetizer awakens everybody on the festival morning and brings the family together at the dinner table (of course after నైవేద్యం / Nivedyam / worshiping to God ). Today I have given a twist to this traditional recipe by adding Spinach / Palak (పాలకూర / पालक). The spinach gives a nice soft texture to your Vada and makes them flavorful. I am sure your little ones does not even notice the vegetables in this one (my little ones did not). Enjoy! Happy Pongal / Sankranthi (సంక్రాంతి )!!! Soak the Urad Dal in water for 5 to 6 hours ( or overnight). Wash the Urad Dal in set aside in the colander, until all the water drains out. Grind the Urad Dal in Grinder or Mixie, by just sprinkling some water. You have to use very minimal water to get nice and thick batter. (Believe me, this is always a challenging step). Take out the batter in a bowl and add Chopped Onions, Curry Leaves, Spinach, Salt, Green Chilies, finely chopped Ginger. Mix all the ingredients well. Take oil (enough for frying) in the Kadai and keep it on the stove. Once the Oil is hot, take the lemon size batter into hand, make a ball and flatten it on a plastic cover ( you can sue ziploc cover) and make a hole in the middle. It should look like a donut shape. Fry them in the oil until they get into golden color. Transfer them into colander with a paper towel, so that all the extra oil oozes out. Transfer them to platter and Serve them Hot. Yum! Yum! Yum! festive dish is ready with a twist of healthy greens full. This can be served hot with spicy coconut chutney (కొబ్బరి పచ్చడి ), Sambar (సాంబారు ) or any Chutney (రోటి పచ్చడి ) like Red Pepper Chutney or Tomatillo Carrot Chutney. If you don't get the good consistency of thick batter, no need to get down I have some tips for you. Because I never get this batter right and looked for alternatives and these tips will make your vada crisper also. 1. If the batter is little loose than expected, you can use Rice Flour accordingly until to get the right consistency. 2. In this recipe the Spinach made my batter little loose after some time and I am out of Rice Flour too, so I have added Graham Flour (Besan Flour / శనగ పిండి ), that turned my vada more golden yellow color and crisper outside and soft inside. They looked beautiful at the end. 3. When you are grinding the batter itself you can add 2 or 3 Tbsp of rice to it. 4. In this recipe as Spinach is already salty by nature, you can use salt sparingly. 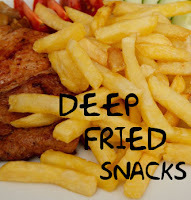 This entry is going to Deep Fried Snacks event at Tickling Palates.